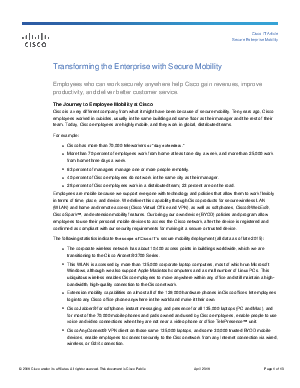 Employees who can work securely anywhere help Cisco gain revenues, improve productivity, and deliver better customer service. Employees are mobile because we support everyone with technology and policies that allow them to work flexibly in terms of time, place, and device. We deliver this capability through Cisco products for secure wireless LAN (WLAN) and home and remote access (Cisco Virtual Office and VPN), as well as softphones, Cisco® WebEx®, Cisco Spark™, and extension mobility features. Our bring your own device (BYOD) policies and program allow employees to use their personal mobile devices to access the Cisco network, after the device is registered and confirmed as compliant with our security requirements for making it a secure or trusted device.